As we’re approaching Mother’s Day here in the U.S. and in many other countries, I’d like to wish all mothers in the Saver community a happy, joyful and special day this weekend! I know that as mothers, we do a lot for our family, so taking some time to do something for ourselves is a challenge in itself. It is my sincere wish that all mothers will take some time this weekend to do something just for themselves, and that may include an uninterrupted bone-building exercise session! The Seated Core And Legs Toner is a very convenient move that can be easily done anywhere, because all you need is a chair. So whether you choose to celebrate Mother’s Day with exercise or relaxation, this challenge can be taken up whenever you’re ready. You’ll easily recognize the motions in this weekend’s challenge. You’ll be doing bicycling motions with your legs, which benefits not only the muscles in your thighs, but also targets your pelvis and core muscles. The ultimate goal of improving bone density and strength is to avoid fractures. Of course, there are many, many more benefits to a bone-healthy lifestyle; but the primary point is to keep your bones from breaking. That means we need to be aware of what bones are most prone to fracture, how fractures happen, and what makes bone able to resist a break. The Weekend Challenges, like the exercises in the Densercise™ Epidensity Training System, are designed to target areas that are chosen based on these key concepts. The Seated Core And Legs Toner targets primarily the pelvis, femur, and vertebrae, areas of the skeleton that are prone to fracture but that are effectively strengthened with targeted exercise and nutrition. In addition, today’s exercise tones the core muscles, which play into fracture prevention two ways: by strengthening the bones to which they attach (such as the pelvis and lumbar vertebrae) and by improving balance to prevent falls. The pelvis is an important area, especially if you have low bone density. It’s important to strengthen this central bone to avoid hip fractures, one of the most painful and difficult fractures to recover from. Today’s exercise works the hip joints without impact, so it’s a great exercise if you need to avoid a lot of force applied to your joints. Because this is a bicycling motion, your thigh muscles and femur bone get a great workout. Both the front and the back of the thigh are involved in today’s challenge. The main muscles in the front of the thigh are the quadriceps, a four-part muscle consisting of the rectus femoris in the center, and the vastus medialis and lateralis on the inner and outer thigh, respectively. The fourth part, the vastus intermedius, lies underneath the rectus femoris. Many people are surprised to learn that the quads originate at the anterior iliac spine (the back of the pelvic “wing”) and rim of the acetabulum (the “socket”), and attach at the base of the femur where it forms the knee joint. That means working your quads targets not only the femur, but your pelvis as well. It’s not just the front of the thigh that gets worked in this move. The backs of your legs, the hamstrings, also get used. Named for the tendon that attaches them to the knees and hips, the hamstrings allow you to bend your knees and bring your legs up and forward, as in today’s challenge. In addition to the legs, the Seated Core And Legs Toner also works the core muscles, which are vital for balance and good posture. Specifically, this exercise targets the abdominals, which are part of your core, as you hold your torso in a semi-reclined position throughout. Your abs include more than just your belly. They also include your obliques, which run along your sides, and deep muscles of the abdomen and back, such as the transversus abdominus and the multifidus, respectively. The transversus abdominus lies very deep in the abdomen where it stabilizes the pelvis and spine. The multifidus is a back muscle that attaches all along your spine, from your neck to your pelvis. It lies close to the vertebrae and is a seldom-mentioned but crucial muscle for proper spinal alignment. As I mentioned earlier, fracture prevention is the major goal in improving bone health. The pelvis, femur, and vertebrae are all prone to fracture, especially if you’ve ever taken osteoporosis drugs, and they are all targeted in today’s challenge. So now, let’s take a look at how to do it. You’ll need a chair for this exercise, one with a back. But if you’d like more of a challenge, you can try a chair or stool without a back. Sit on the front edge of the chair with your hands on the sides of the chair seat and your feet flat on the floor. Lean back until your back is lightly touching the chair back. Now lift your feet and begin to make bicycling motions. If you can’t lift your feet very far off the ground, that is no problem; just lift them as high as you can. Slowly continue the bicycling for about one minute, and repeat at least five times. It’s okay if you can’t do this for a whole minute. Just do what you can according to your fitness level. Tighten your abs to hold your torso in a semi-reclining position, and to get even more abdominal toning out of this move. Don’t press against the chair back; hold your back just lightly against it. Keep your feet up throughout the exercise – try not to let them touch the floor. Your spine should be in a straight line from your hips to your shoulders. Don’t round out your back or arch it forward. Believe me, it’s more challenging than it looks! 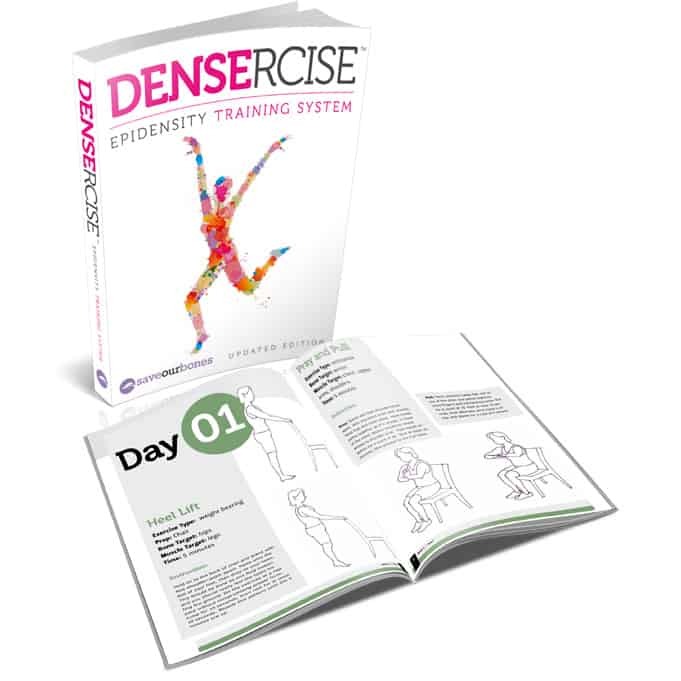 While the Weekend Challenges are unique to this website, the Densercise™ Epidensity Training System includes many similar exercises that work these and other key areas of the skeleton. An exercise program that is specifically designed to improve bone density, Densercise™ includes moves that also promote balance, build bone, and improve posture. Like today’s exercise, Densercise™ does not require expensive equipment or any extreme movements. It takes just 15 minutes a day, three days a week to improve your bone health and decrease your risk of fracture. As always, I love to hear responses from the community. If you’d like to share any exercise tips or thoughts about the Seated Core And Legs Toner, please do so by leaving a comment below. Hi Vivian and everyone, thank you for all the great exercises. I seem not to have enough strength to keep my legs in the air, not touching ground. I weigh 60kg for 1.83m (6`) frame. either my legs are too long, or all my core muscles se weak. Should I just do sit ups and other abdominals to develop muscle mass, before I tackle today`s challenge? Thanks for any insight you might have! I would like to order Bone Appetit in the paper format – not as an rook. I have sent several requests and received no response , although I continue to get your unsolicited emails. “Change Subscriber Options” (there is a blue link there that you click on and it will take you to the unsubscribe page). Yes, was quite a difficult exercise. Thanks. You’re welcome, Shula. This exercise is more challenging than it looks! Off & on go through your mails.Since in Pakistan how your programmes/herbal treatments be available,don’t know.I am a case of severe osteoporosis plus muscle loss of lower limbs due to renak failure and Dialysis.It’s very unfortunate that gradually my condition will deteriorate.Now with secondary hyperparathyroidism I have like a fragile being.Thank you for the information you keep on mailing. Having been diagnosed with osteoporosis a few years ago I am grateful for your wealth of information to stabilize if not reverse. I appreciate your articles and wonder if you have ever posted one on hip replacement options. I am scheduled for early June and yet, curious if this could be avoided by following your diet plan to eliminate inflammation and build bone formation. Any studies to suggest new cartiledge formation as well? I look forward to hearing your input. Thank you. I have severe osteoporosis and a spine rod and joint replacement some done some I am not ready for another. I was years on different osteoporosis meds, but after a narcotics detox which is amazing and horrible I started back to being more natural the way I used to be I discovered you and Young Living and together I’m trying to improve my health and help others especially if I can help them before they have what happened to me!!! I am adding your information but with your name is this okay?? Good Morning Savers, Todays exercises and article are great as usual. I wish to share something with you that should let you know that what you learn here is the very best you can do for yourself thanks to Vivian. I am working on my osteoposis and am a cancer survivor. Unfortunately, I went conventional before so its back and I seek information from several sources. The natural, organic way that allows your body to heal while we help by doing the right things instead of poisons. If you ever want another opinion for what you read here about osteoporosis, A book by Dr. Robert Thompson “The Calcium Lie Book” the article I read tells about everything you’ve been told here proving we are in the right place to save ourselves. Please do take a look as I call it, for a second opinion… You’ll never go wrong with what you learn here.. Thanks Vivian, we need all the help we can get… Blessings to you and those who work with you…. Thanks for sharing your thoughts, L.D., and I am sorry to hear about your cancer diagnosis. I wish you a successful resolution to all of your health concerns, and I commend you for doing your research!